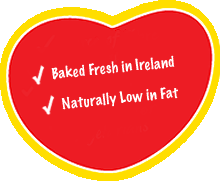 New from Irish Pride, Irish Pride Fresh White Wraps are the delicious way to liven up snack and mealtimes. Handcrafted daily in Ireland to an authentic recipe, each wrap is double layered for that fresh, soft bite. They’re also naturally low in fat, so for a simple and versatile sandwich, get wrapping! These wraps contain wheat. These wraps may contain traces of nuts.